Jeffrey Brown (JB) was named chief executive officer of Ally Financial in February 2015 and also serves on its board of directors. Brown is driving Ally’s evolution as a leading digital financial services company. Under his leadership, Ally is building on its strengths in auto financing, retail deposits and corporate financing, as well as diversifying its offerings to include digital wealth management and online brokerage, a credit card and mortgage products. Brown has deep financial services experience, having previously served in a variety of key leadership roles at Ally. Prior to being named CEO, Brown was president and CEO of Ally’s Dealer Financial Services business, where he oversaw the company’s automotive finance, insurance and auto servicing operations. 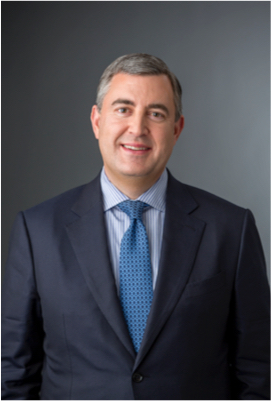 Brown joined Ally in March 2009 as corporate treasurer and, in 2011, was named executive vice president of finance and corporate planning, where he oversaw the company’s finance, treasury and corporate strategy initiatives. Prior to joining Ally, Brown was the corporate treasurer for Bank of America, where he had responsibility for the core treasury functions, including funding and managing interest rate risk. Brown spent 10 years at Bank of America, beginning his career in finance and later joining the balance sheet management division. During his tenure at Bank of America, he also served as the bank’s deputy treasurer and oversaw balance sheet management and the company’s corporate funding division. Brown received a bachelor’s degree in economics from Clemson University and an executive master’s degree in business from Queens University in Charlotte. He serves on the Board of the Clemson University Foundation, an independent, not-for-profit entity that promotes the welfare and future development of Clemson University, the Trevillian Cabinet of the College of Business and Behavioral Sciences at Clemson University and on the Board of Trustees for Queens University in Charlotte. In 2018, Brown was appointed by the Board of Directors of the Federal Reserve Bank of Chicago to serve as the Federal Advisory Council representative for the Seventh Federal Reserve District. Brown was recognized for his commitment to family, career and community with a 2016 Father of the Year award by the Father’s Day Council and benefiting the American Diabetes Association.